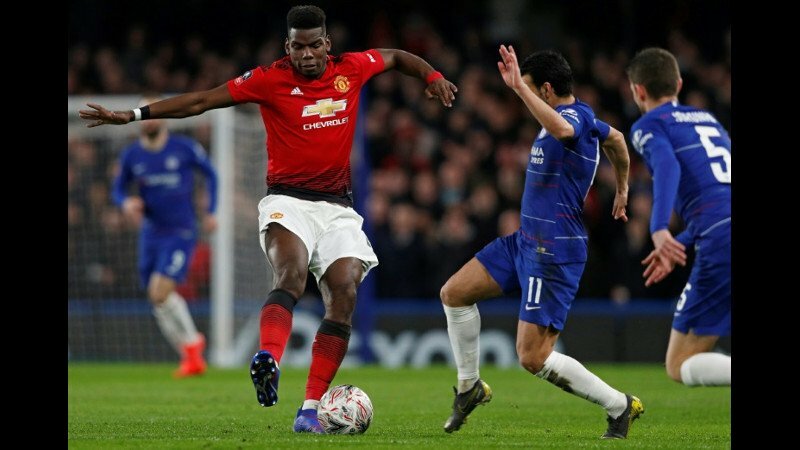 FOOTBALL: Paul Pogba drove Manchester United into the FA Cup quarter-finals and pushed Chelsea manager Maurizio Sarri closer to the sack as the troubled holders crashed to a 2-0 defeat on Monday. Pogba set up United's opening goal for Ander Herrera with a majestic cross and the France star added the second himself as Ole Gunnar Solskjaer's side produced a commanding display at Stamford Bridge. Chelsea's lacklustre fifth round exit -- their first FA Cup defeat since the 2017 final -- was another painful blow for Sarri, who is facing a fight to save his job following a dismal debut season. Sarri was subjected to chants of "you don't know what you're doing" and "you're getting sacked in the morning" from frustrated Chelsea fans, who called for their former star Frank Lampard, now in charge of Derby, to replace the Italian. Chelsea, currently outside the Premier League's top four, return to action against Malmo in the Europa League last 32 second leg holding a 2-1 lead on Thursday. Assuming he hasn't been axed by demanding Chelsea owner Roman Abramovich before then, a shock defeat against Malmo would be catastrophic for Sarri ahead of next Sunday's League Cup Final date with Manchester City. Ending United's nine-game winless run at Chelsea was another feather in Solskjaer's cap as his team bounced back from last week's Champions League last 16 first leg loss to Paris Saint-Germain. Even Solskjaer's risky decision to select reserve goalkeeper Sergio Romero in place of David De Gea paid off. In a frantic opening, Romero was called into action when David Luiz drilled a dipping free-kick over the United wall. Romero kept out Luiz's effort and scrambled to his feet to save Pedro's powerful shot from the rebound. Gonzalo Higuain should have opened the scoring from Cesar Azpilicueta's teasing cross, but the Argentine striker headed wide. Those misses proved fatal for Chelsea, whose early pressure was rendered irrelevant by another lapse of concentration in the 31st minute. Mata picked out Pogba on the left wing and the United midfielder, unchecked by the slow-to-react Antonio Rudiger, unfurled a sublime cross that looped towards the far post. Herrera timed his run perfectly to meet Pogba's delivery in stride and Marcos Alonso fatally lost his man as the Spanish midfielder planted a close-range header past Kepa Arrizabalaga for his first goal since December. Pogba was only just getting warmed up and he single-handedly ripped Chelsea part to double United's lead on the stroke of half-time. Playing an incisive pass down the right flank to Rashford, Pogba surged into the Chelsea area and muscled his way above Azpilicueta to meet his team-mate's pin-point cross with a diving header that Kepa couldn't keep out. It was the 15th goal Pogba has been directly involved since Solskjaer took charge, underlined his renaissance since the sacking of his nemesis Jose Mourinho. Nothing was going Sarri's way and United's Nemanja Matic, already booked, avoided a red card after tripping N'Golo Kante. Even Eden Hazard, marked out of the game for long periods, couldn't rescue the beleaguered Sarri as he found a sliver of space, only to see his shot deflected over by Victor Lindelof as Chelsea succumbed tamely.